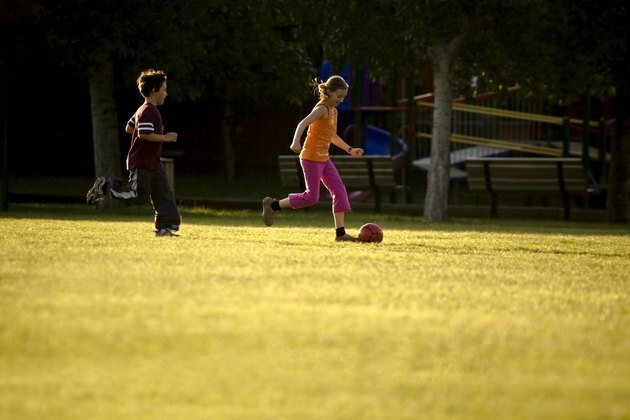 Children should play soccer solely for exercise and fun at young ages. Once they reach about 9 or 10 years old, they can begin to focus on the technical aspects of the game. Soccer drills help children improve their soccer skills and can help catapult players into higher levels of play as they mature. Combine drills with childhood games to get 9- and 10-year-olds involved in building their individual skills. The "Monkey in the Middle" drill teaches three players how to handle passes and move the ball quickly to another player, and it teaches one player the quick footwork needed to intercept passes. Three players stand at the corners of an imaginary triangle and kick the ball to each other. A fourth player starts in the middle of the triangle then tries to intercept passes from the three at the corners. If the player in the middle, known as the monkey, gets the ball, then one of the corner players goes into the center and takes over the monkey role. Learning how to dribble while running at full speed is a skill that kids need as they get older. The Team Reaction Dribbling Drill provides a race situation that makes dribbling at speed fun. Designate a box that is about 20 yards long on each side, and then place flags about 7 to 10 yards farther away from the boundary at each corner, advises the Soccer Xpert website. Each player has his own ball and dribbles within the 20-by-20 box. When the coach calls a certain player's name, that player immediately starts dribbling toward the flag of his choice and the teammates must follow. The final player to dribble the ball around the flag loses. The drill teaches players to maintain proper technique while still aiming for quickness. Kids like to knock things over, so the Topple Ball drill will entertain while at the same time teaching shot accuracy. In the center of a circle, place a large cone with a soccer ball on top of it, and around the outside of the circle set up a spot for each player to shoot from. Each player shoots her ball and tries to knock the center ball from its perch. The drill teaches accuracy and proper striking technique. The World Cup Soccer Drill teaches 9- to 10-year-old players teamwork. Select three players each for four different teams and one goalie. Each team wears a different colored shirt. It is essentially 3-on-9 for the first round of the "tournament," as any team that has the ball will be facing nine defenders. The goalie defends against all four teams. The first team that scores gets to sit out, and the three remaining teams play, making it 3-on-6. The next team to score sits out, and then one more team will score. The last team left is eliminated from the tournament. The tournament restarts with three teams, playing 3-on-6 and the same system applies. When the final two teams play 3-on-3, whoever scores two goals first wins the tournament.